With the Unofficial Hunger Games Cookbook being served up recently, we got to thinking about what other unusual products we’d like to see in stores everywhere that are based on the book and soon-to-be-released blockbuster. Game day is fast approaching, and people can’t contain their excitement about the first Hunger Games film, opening this Friday. 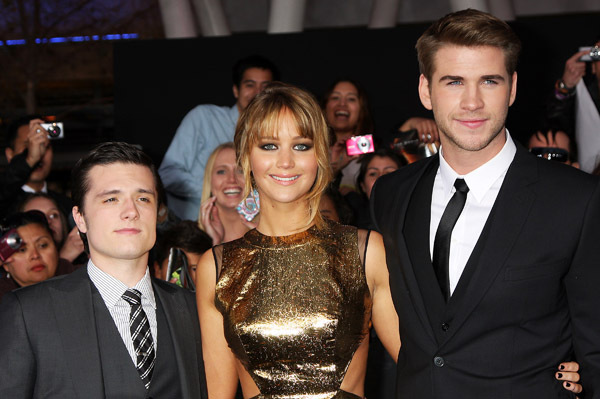 In anticipation of the movie, we have seen a celebration of every aspect of The Hunger Games, from the film’s stars to its strange and inspiring fashions. Most recently, the release of an Unofficial Hunger Games Cookbook, written by Emily Ansara Baines, has whetted our appetites for the film. The cookbook features recipes for meals inspired by those found in The Hunger Games text itself. Count on being stuffed with meats you’ve never tried mixed with root vegetables you didn’t know existed. Of products to be spun off a film, this one is certainly unusual, albeit very creative and actually pretty logical. Food plays a major role in The Hunger Games, and it makes sense that someone would jump on that potential money-maker immediately. As we are beginning to see with the influx of Hunger Games-inspired clothing, accessories and toys, there is a world of product opportunity out there for such a richly detailed book that depicts such an entire world so clearly. What other Hunger Games inspired products do we hope to see on store shelves in the near future? You know you’re a cultural staple when they make a Monopoly game based on you. The Hunger Games would join the ranks of Star Wars and Harry Potter with a variation of this board game in its honour. Properties for sale would be each of the twelve Districts, with District 12 being the least expensive and District 1 costing the most. Rewards would include getting a trip to the Capitol, receiving sponsorship and killing a large animal that can be sold for a tidy sum at the Black Market. Players wouldn’t be sent to jail, but to a holding cell in the Capitol. Monetary transactions would be done with Panem currency. The playing pieces would be anything from a bow-and-arrow to a mockingjay. There are countless details in The Hunger Games that are conducive to a dedicated Monopoly game. Its release is probably only a matter of time. One of the most intriguing aspects of The Hunger Games is its medical treatments. While in the arena, Katniss and her competitors use strange plant-based balms and potions with lightning-fast healing properties. Surely such respect for the powers of nature has the potential to inspire a whole line of natural medicinal treatments. This line of products would encourage people to put down the pills and rub some of this ointment on instead. The packaging could be very effective, with products coming in charming little vials or tiny cauldrons. Some may even be DIY — you chew the healing leaves and apply them to the afflicted area yourself. Everyone might begin to smell heavily of pine and soil, but it’ll be all-natural. In The Hunger Games, the last word in fashion belongs to Katniss’ stylist, Cinna (played on film by Lenny Kravitz). It is thanks to him that Katniss grabs the public eye immediately, with her flaming Opening Ceremonies dress. Throughout The Hunger Games, Cinna constantly nails Katniss’s look, making her a totally accidental fashion icon. Wouldn’t you love a stylist like Cinna in your corner, too? Well, with a book that spells out Cinna’s style secrets, you could have just that. This seems like as natural idea as a Hunger Games-inspired cookbook. People who can’t get enough of the bold choices dictated by this incomparable stylist can subscribe to his fiery fashion philosophies. Soon, our wardrobes, once stocked with sensible beiges and blacks, will be overwhelmingly gold and glistening. Get ready to stop traffic. Sure, action figures are an awesome way to re-enact your favourite moments from The Hunger Games, but they’re no fun to snuggle up to when the sun goes down. That’s why we’d like to see a line of plush toys, inspired by the creatures found in The Hunger Games. There is a veritable zoo running around The Hunger Games, curious creatures that deserve some attention. Who wouldn’t want to get cozy with their very own mockingjay, complete with recording device so you can record what you want it to sing back to you? There would also certainly be room for a stuffed Lady (Primrose’s goat). And don’t forget those feisty wolf-creature “muttations.” They may look scary from far away or when they’re slowly eating you to death, but they can also be super cuddly.